Mr. Star Wars is that kid who will knock on your door and ask to rake your leaves for a nominal fee. He likes earning money. He reminds me a little of Henry Huggins. One of my dearest friends’ parents is organizing a convention for a large organization and needs 500 Rainbow Loom bracelets. TheRoomFriend threw out a request for the bracelets probably without really expecting a response. I offered Mr. Star Wars’ services. As you may have gathered, when we dive into a project at TheRoomMom’s house there is no tolerance for low effort or half assed commitment. It’s over-the-top extreme project work or nothing at all. Since Friday, we have “loomed” 189 bracelets. Mr. Star Wars is getting paid per bracelet. More importantly, he has used just about every 3rd grade math and time management skill he has to complete this job. Here is the list of skills we covered with this job order. I am tempted to match it to the Common Core Standards that are all the buzz right now, but I will refrain. 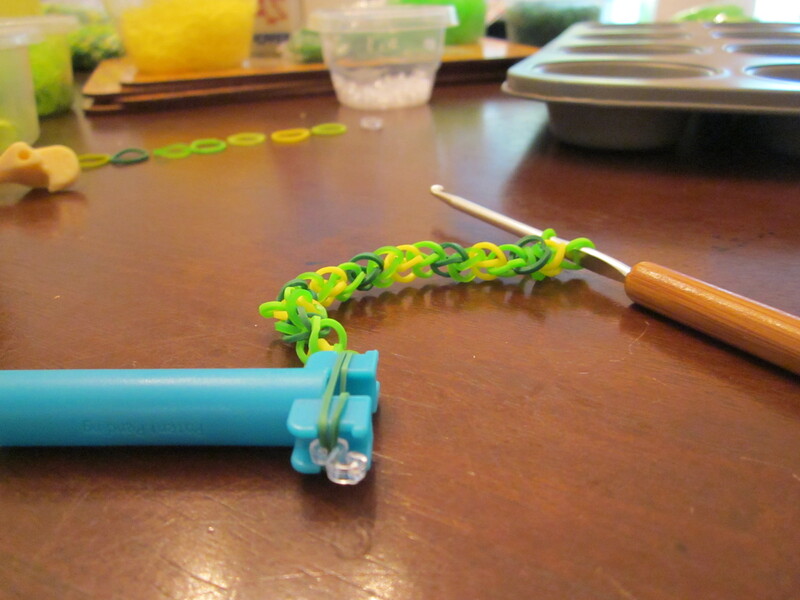 Pre-Planning— Before we committed to the order, Mr. Star Wars made one sample bracelet. We needed to know the time it would take to finish one bracelet and how many bands we would use in each bracelet. We created a ladies’ size (24 bands) and a men’s size (28 bands). Setting Manageable Goals (Ha! As if I ever limit myself to the manageable and appropriate level)– We committed to 100 bands and agreed to try to make more. 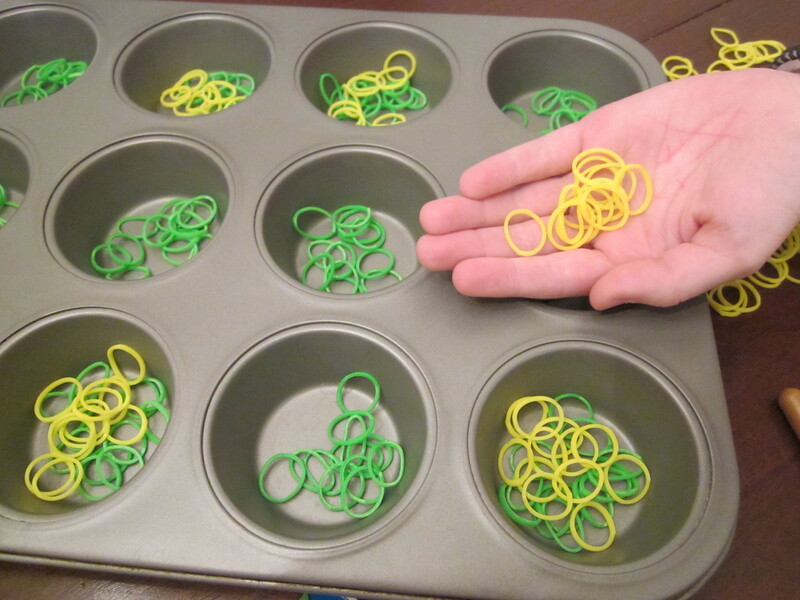 Mental Math— The order is for green and yellow bracelets. I hit every store in our area for the right colors. We bought bags of 600, 300, and 100. There were fewer yellow available and various shades of green. We had to do a little mental math at the store to calculate how many bands we would need to make at least 100 bracelets. Rounding— we rounded each bracelet to 25 bands since that divides into 100 so nicely. A bag of 600 would give us about 24 bracelets. I bought extra… just in case we felt like making more than 100 (as if there was any doubt). Patterns— We couldn’t just open every bag of bands and dump them on the table. The bracelet colors had to be consistent. We use 2-3 shades of green and 1 yellow in each bracelet. Math Facts— Do you remember the math facts tips from last week? Mr. Star Wars had to calculate how many bands he needed in each color for each sized bracelet. He came up with several groupings. In the ladies’ size, we have 3 colors of 8 bands each or 4 colors of 6 bands each. In the men’s size, we have 3 colors of 9 bands each and add one extra of the starting color or 4 colors of 7 bands each. Grouping— We count out the groups of bands in coordinating colors into a 12-cup cupcake pan. 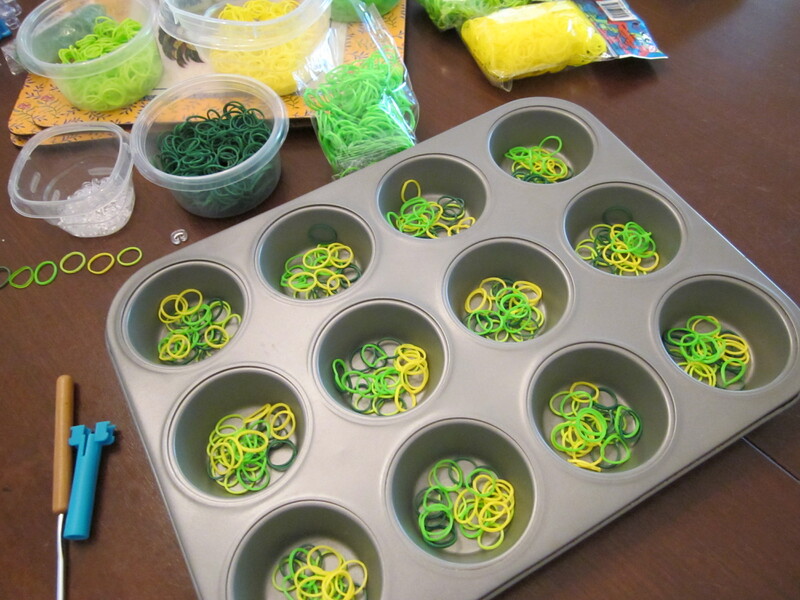 We produce 12 bracelets at a time and then re-fill the cupcake pan. After 4 groups of 12 in one size, we make 2 more for a total of 50. We then switch to the other sized bracelet. 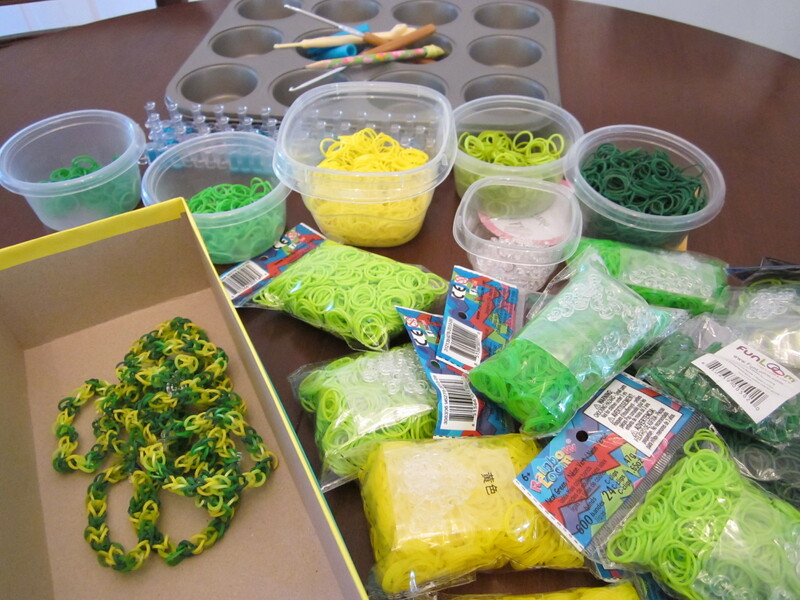 Collaboration— When we started, it took Mr. Star Wars about 5 minutes to make 1 single chain Rainbow Loom bracelet. Pulling the bands off the crochet hook and over the next band was slowing him down. 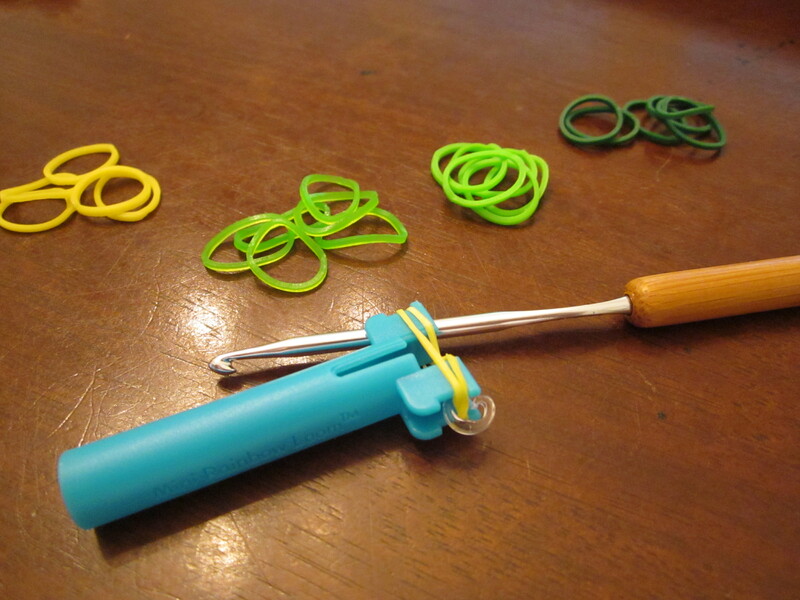 We figured out a tandem system where one person holds the crochet hook, and the other moves the bands. We cut the production time to less than 3 minutes per bracelet. Problem Solving— We negotiated a price per bracelet that did not include the materials. When we set the price, we worked out the number of bracelets we could make in an hour, and Mr. Star Wars came up with an hourly rate. We then divided the number of bracelets by the cost per hour and proposed a price. Earnings— Mr. Star Wars constantly calculates how much he will earn every time we finish another group of bracelets. Our price per bracelet is less than a dollar, so he is having to convert cents to dollars. Time Management— We need to mail the bracelets by Saturday in order for TheRoomFriend to get them in time. We set a goal (200) and divided that by the days we had. We had more time to work this past weekend than we will this week, so we adjusted for that. We set a quota for each day. Rewards— TheRoomFriend offered us a bonus for any bracelets we make above 200. We should hit 200 by tonight (Mr. Star Wars and Miss Priss are looming while I type). We now have an incentive to go above the goal. I have to say, I am impressed and would hire Mr. Star Wars in a heartbeat. 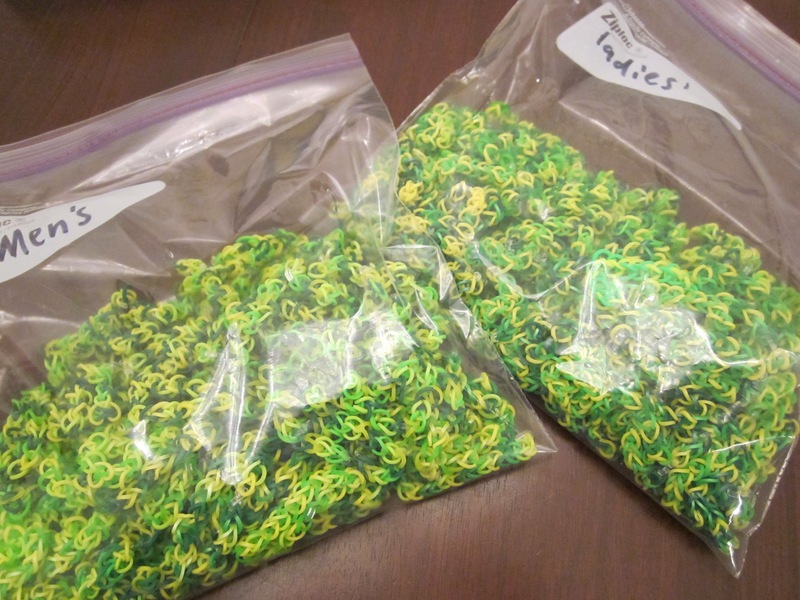 Almost 200 Rainbow Loom bracelets. They are like big bags of green Ramen noodles.